The flowers in our hotel lobby: fragrant casablanca lilies with ivy, served up in fluted glass vases in which the water had been tinted ruby red. A classic presentation. A narrow street in "Old" Zurich, the historic area of the city. I have used the word charming all too often, but I cannot think of another word that more closely describes this city. 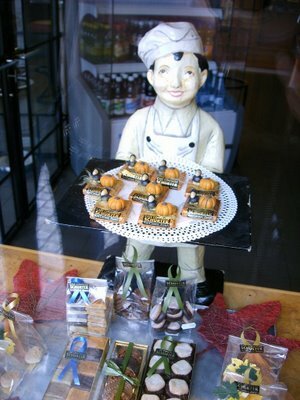 This little baker boy lived on that street, residing in a bakery window, plying his seasonal wares of marzipan pumpkins. Yum. One of the many apartments, hotels, inns and residences with overflowing window boxes. Such a cheerful countenance, even when the skies are grey, as they were that morning. 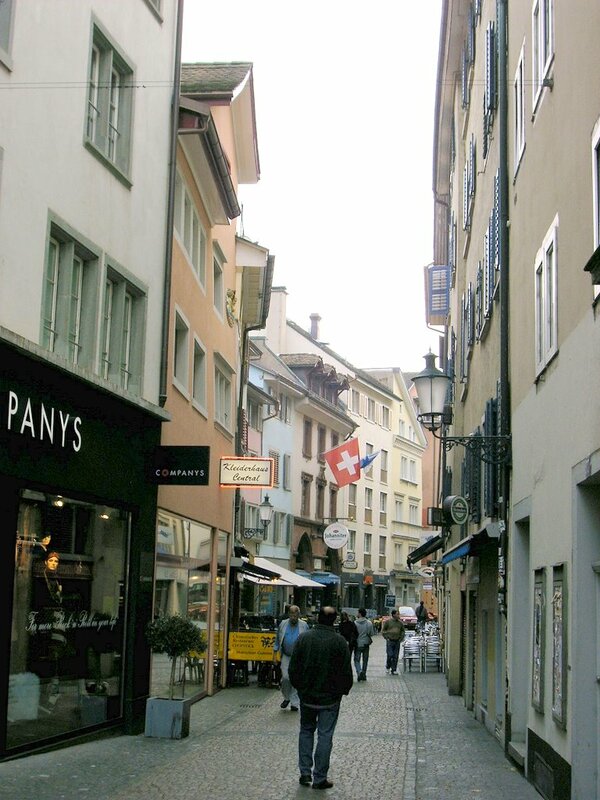 Zurich is a city of some 400,000 people, which was founded by the Romans, but was not recorded in official documents until the year 929. It always amazes me how similar things look when your somewhere else and yet how much they look like something in some other country. I love the old buildings and some days think that I must have lived another life as someone who love and lived in one of these places. I don't know about Michele though, I think she just lives on her blog but she likes it when other people get out and say hello for her. Hello from Michele~! Michele sent me this time, Judy! Hi. Zurich certainly looks nice but it's Lake Como, pictured below, that I'd really, really like to see. I've always heard that it's so beautiful. The narrow cobblestone or brick streets are fabulous. And marzipan.... I love the taste of almond. Sigh. I've never been to Switzerland, except the airport in Zurich where we changed planes for Linz. Wonderful photos Kenju! They make me want to hop in & walk the streets... and sample the treats!! And breathe in the aromas! Ahhhhhh! Oh, there's nothing like wandering the small side streets in Europe! I'm going to stay and read more about your trip and enjoy the lovely photos! Great photos, though making me long for Europe. Now there is a place I would love to get lost in, camera in hand. What gorgous pictures. I so want to travel the world but I also so hate flying! That makes it tough! Michele sent me today and says "hello". Have a great weekend. i think "charming" is an accurate word. i loved utenzi's comment about the angel- funny! These are wonderful pictures!!!! I have never been there. Michele sent me! Have a wonderful Friday! 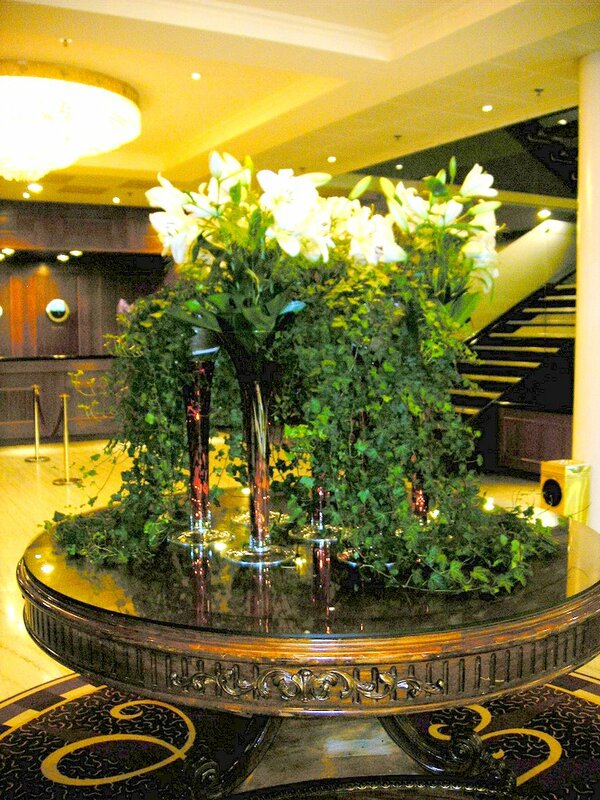 did i mention last time i was here how much i like those centerpieces in your lobby? I have so enjoyed seeing your photos!! My friend's wife was only 53, and died from breast cancer. It's just incredible how many women are succumbing... Awful. I absolutely adore the "Purple Angel"...so imaginative and colorful....BEAUTIFUL! 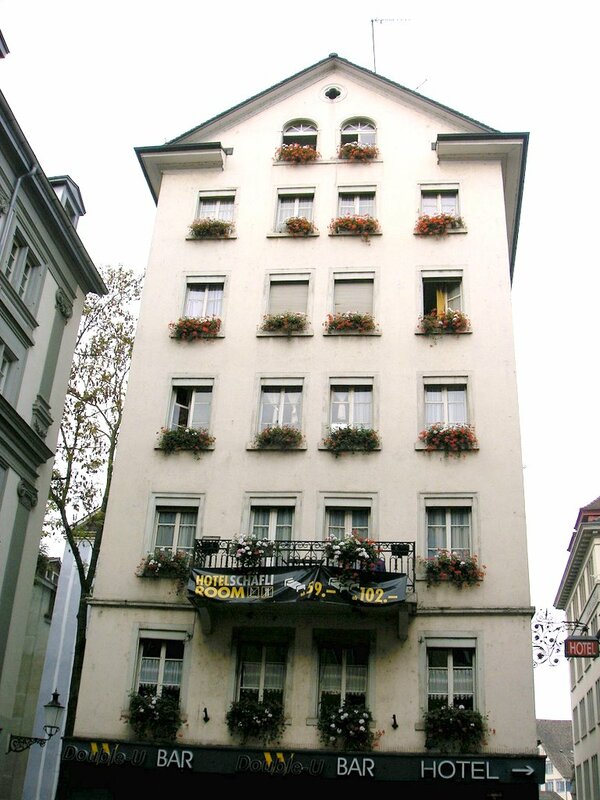 Love all of Zurich....it is an Amazing city, isn't it...and to think it is really a small city----400.000..I mean, compared to so very many other GREART GREAT AMAZING cities of the world, iZurich is really tiny..but, very very special! LOVE these pictures Judy....just love them! Here from Michele tonight, my dear.